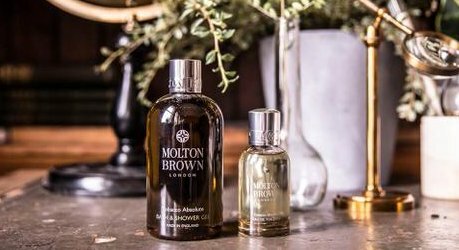 Molton Brown has launched Tobacco Absolute, a new fragrance for men. Tobacco Absolute is inspired by celebrated, eighteenth century British botanist Dr. William Houstoun and his discovery of a new type of tobacco plant in South America. He carefully transported this exciting new specimen back to London's burgeoning botanical gardens, the scent of which still remains one of the most distinctive in the world today. [...] A warm, woody eau de toilette that combines complex notes of Paraguayan tobacco, balsam and musk, lifted by a hint of vibrant grapefruit. Additional notes include elemi, bergamot, cedar, nutmeg, rosewood, leather and Peruvian balsam. Molton Brown Tobacco Absolute is available in 50 ml Eau de Toilette and in matching grooming products. I tried this last week and was very excited as I love tobacco fragrances but this one bored the pants off me and was also very fleeting. The price was low but now I know why. Too bad. I was thinking the body products would layer nicely with Tom Ford’s Noir Pour Femme. I felt that the body products were the main point and the EDT was an afterthought to lead a few more people towards the rest of the range. The body products may work better – especially when layered as you say !